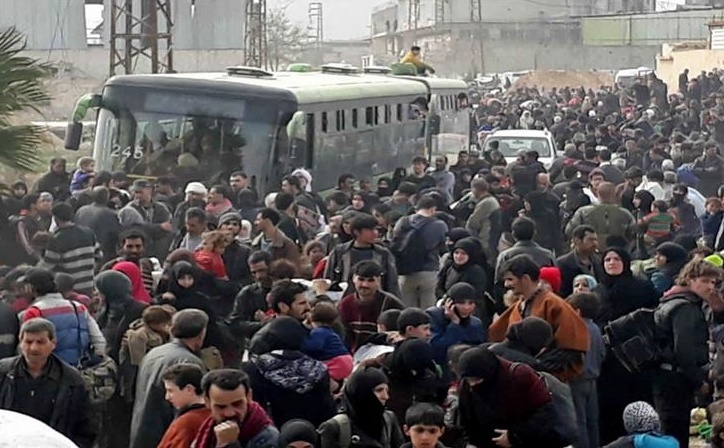 Syrians in regime-held territory are paying smugglers thousands of dollars to leave, heading for the major opposition area in northwest Syria. The smuggling routes were once used as escape routes for fighters and civilians fleeing sieges during Syria’s eight-year conflict. Now corrupt officials in the regime’s security apparatus help arrange the departures, according to activists and analysts. And Abu Muhammad, from a working-class neighborhood in south Damascus, paid $1,650 to reach Idlib Province in northwest Syria. He describes a dozen people moving house to house, usually at night, with the last part of the journey including a walk in pitch-dark towards the frontlines between regime forces and rebels. Residents and activists speak of the involvement of senior regime officers, including from military intelligence’s Palestine Branch, in the smuggling networks. They say that, for years, officers have taken thousands of dollars to help arrange flights. Abu Ammar says he left southern Syria, paying about $2,500, after “false promises of security” following the regime’s reoccupation, with “targeting [of] people seen as close to the revolution through kidnapping and assassasination”. The flights come almost exactly a year after pro-Assad forces, with months of siege and deadly conventional and chemical attacks, recaptured the East Ghouta region near Damascus. Men speak of going into hiding after they receive summons to serve in the regime’s military. Others have disappeared, presumably arrested. Movement is restricted, with an official letter needed to go even to the nearby capital. Residents talk of daily loops by Russian military personnel, with little contact with civilians and no clarity on their role.